Bella Muntean, a vivacious and caring 15 year old, loved music and played the flute in her Middle and High School Band Programs. She was passionate about doing things that made her happy. She thought of her band as a family and wanted so badly to be a part of the programs as she was working her way through chemo and radiation treatments. During her battle with cancer, her faith and joy for music never wavered or faltered. 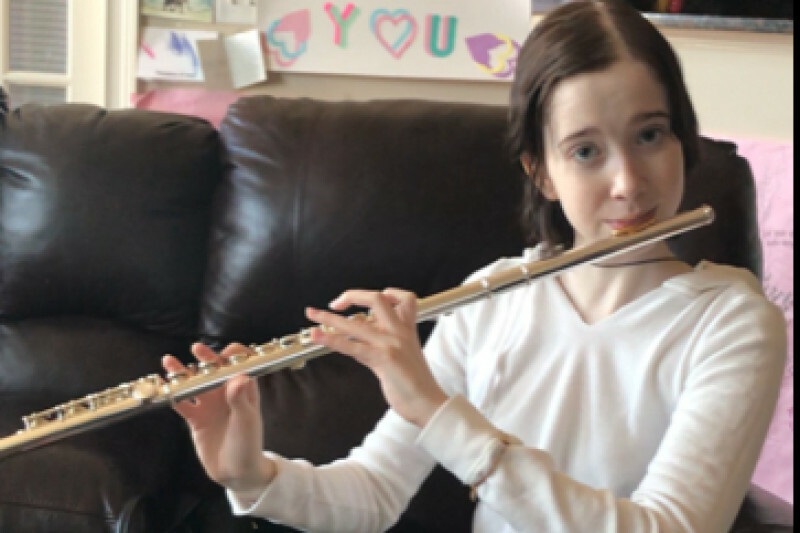 It was a miracle that with hundreds of bone tumors in her lungs that she was able to play the flute so effortlessly and passionately. She was truly a shining example of what a band student should be. We at Riverside High School and Middle School Bands in Greer, South Carolina, want to spread this attitude of unwavering faith and passion through music. It is for this reason that we will be collecting donations to go towards a commission of a band piece that will be written in Bella's honor. A composer has already been contacted and made aware of Bella's story. He is so thrilled to begin working. The cost of this commission will be around $4,000. Please make donations on this go fund me page or send checks for donations to the Riverside High School Band Boosters. Checks may be made out to Riverside Band Boosters and sent to 794 Hammett Bridge Road, Greer, SC 29650. We want to have something composed for Bella that will bring the joy of music to students all across the country. The piece will be available for purchase and other band programs will play it and share the story of Bella. Will you help make this possible? Thank you for your time and support of this effort!